Assassin’s Creed Origins is perhaps the farthest that an entry in the franchise has gotten from what makes Assassin’s Creed… Assassin’s Creed. And at the same time, it’s the closest as any of them have ever gotten, considering that Origins is supposed to be exactly what the title suggests: the inception point of the entire franchise. Taking place in both present day, but mostly in ancient Egypt during the last days of the Ptolemy Dynasty — you know, the one with all the drama involving Cleopatra, Romans and Greeks — Assassin’s Creed Origins gameplay-wise is a departure from the tried and true mold of what Assassin’s Creed has become in the decade of releases since the original game. Taking cues from a lot of different open world adventures, most notably CD Projekt Red’s fantastic The Witcher 3: Wild Hunt. Origins comfortably borrows from that playbook and runs with it, only now having a gigantic, breathtakingly gorgeous map of late-era ancient Egypt full of stuff to do. Ubisoft and their multiple studios all over the globe have managed to craft a lived in setting that I couldn’t help but want to explore just about every corner of — and lo and behold, for the many parts that I have done so over thirty hours playing this game, have found something that made it worth it. You borrow the guise of Bayek, a Medjay — a peacekeeper from ancient Egypt of sorts — who stumbles upon a global conspiracy that’s being headed by a shadowy group known only by the Order, who end up killing his son, driving him to hunt them down along with his wife, Aya. Unlike the dual protagonists of the previous Assassin’s Creed, Syndicate, Origins’ manages to be very compelling and with plenty of character development all throughout. And even though you spend the majority of the game playing as Bayek, the few times you control Aya are significant to the overall story, thanks to the pacing, that even though sometimes falls to the weight of Origins open world structure — especially the fact that missions now are dependant of what level you’re currently at in order to be completed — is still gripping and surprisingly emotional. Having Assassin’s Creed make the jump to an even more open world gameplay structure might seem daunting at first, and Origins’ gigantic map makes it even more intimidating. Perhaps one of the biggest settings out of the entire franchise, Egypt feels humongous. Even with more than thirty hours into the game, I’ve yet to see every location. And differently from a lot of other similar games, I actually want to see it all, thanks to the sheer variety that there is to see in Origins. Be it a new tomb I’ve just stumbled upon or simply some curious rock formations that happen to nest a new viewpoint that I can synchronize to — yeah, those still exist in this game, but serve somewhat of a different purpose, giving more range for your eagle scout that can mark targets and points of interest at the touch of a button — I’ve yet to stumble upon something I don’t want to spend some time exploring and absorbing. It’s a really well designed game world that feels realistic in terms of scale, but with just enough things to do in between the big chunks of space you travel across. There’s always a new ‘?’ point towards somewhere new to explore, and more likely than not, it’s worth the trip. Even though Assassin’s Creed Origins is much more open than its brethren, it still adheres to elements that make it an Assassin’s Creed. Although it’s much more watered down than even in recent AC games, climbing structures and obstacles is still a viable way of getting around. 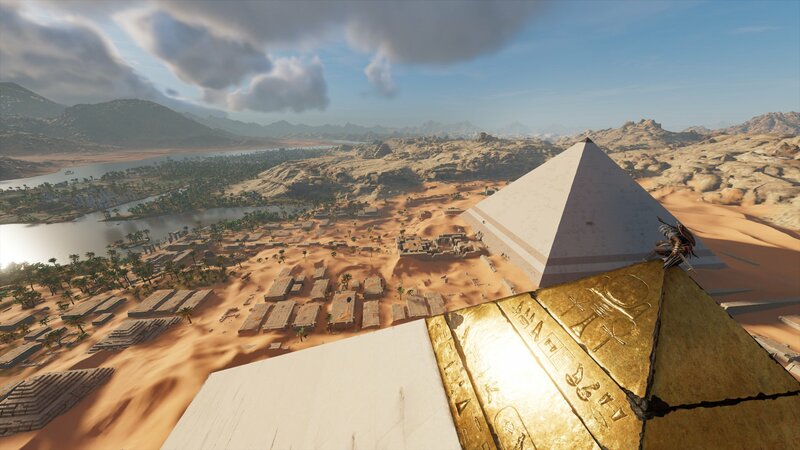 Be it the buildings of Alexandria to the huge pyramids of Gyza, Bayek nimbly conquers them with ease as long as you hold the climb button. It’s a far cry from the environmental traversal puzzles of early AC games surely, but Origins is none the worse for it. The simplicity of control adds to the rhythm of movement, and even though there’s no way of making Bayek run any faster like it Ezio or Connor, you won’t have to do any finger gymnastics with your controller in order to have him jump over a fence or skip off a roof. Combat-wise, Origins borrows a lot from Dark Souls and its kin. Even though I didn’t particularly fall in love with the change during my time testing the game at this year’s E3, after making my way through its final version, I’ve come back around to enjoying the change. Having all attacks mapped to the shoulder buttons and triggers felt familiar to me right away. Enemies don’t wait for their turn to attack and often outnumber Bayek, forcing you to keep moving and be aggressive. It’s a more dynamic setup than the usual waiting for a counter to pop up, zip to the next target, off them, rinse and repeat that became the norm for Assassin’s Creed and a number of other open world games which I certainly appreciated after playing many of those of the last few years. The same goes for the gameplay structure. This new Assassin’s Creed’s map is full of side activities to do besides the main missions, with side quests that are not only fun to partake in, but also written extremely well. So well, in fact, that it’s through them that you see most of the character development in the game. One such quests has Bayek showing off his diving skills to a group of street urchins; while it would’ve been easy for it to be just a throwaway mission that nets you some experience points, it turns out to be one of the more heartwarming moments in the game. It’s a good thing then that these side missions are so enjoyable, because you’ll need to play through quite a few of them if you want to get through Origins’ main story quests. Everything you do in the game, from discovering locations, picking up items to fighting earns you XP that go towards expanding Bayek’s health pool and the damage he does in combat. The side content is where you get the bulk of the points, and since all missions are tied to a level. If you’re more than two points below, they become incredibly tough to do since enemies tend to 1-hit or 2-hit kill if they’re too higher of a level than you. It feels a little gamey on paper, sure, but there’s just so much I could do to get to the required level and it never got boring. You’re also given the choice to use skill points and invest on one of three skill trees. You find a lot of assassination and ranged combat perks under the Hunter branch, while melee damage and pure combat skills rest under the Warrior section. The third portion, Seer, is where some of the crazier powers lie, like taming wild animals and have them fight alongside Bayek, as well as developing poison darts that can either poison or distract enemies. Origins gives you so many skill points that by the second half of game you’ll probably be able to get most, if not all of the blips filled in Bayek’s skill tree. Where in most open world games that would simply make you an unstoppable killing machine, here, thanks to the constant leveling that bumps up enemies, it simply gives you more tools to play around and be creative with. Even the historical bits in the game are done incredibly well. In true Assassin’s Creed fashion, you bump into a few key famous political figures of the time, such as aforementioned Cleopatra, who ends up expectedly playing a huge role in the plot, as well as other familiar faces who would better go unspoiled. If you know a little world history, you probably know what’s bound to happen to them, and still be caught off guard by a few surprises thanks to lovable, crazy AC lore. Assassin’s Creed Origins turned out to be one of the biggest surprises in an already amazing year for videogames. Ubisoft saw it as a chance to do what the last decade of open world games have been doing ever since the original Assassin’s Creed by unapologetically borrowing the best elements from other successful games while keeping the very best core AC elements. And it works brilliantly thanks to a really well developed setting and story, but most importantly, constraint. It respects your time and effort by delivering excellent moments and rewards all throughout the game. Assassin’s Creed needed a shake up and Origins is exactly that.